What is an Ice Fishing Heater? Are you really prepared for the upcoming ice fishing season? For some ice fishing enthusiasts, no discomfort or trouble is too much to endure in the pursuit of this hobby. While some anglers prefer to go old school and make do with just a hole in the ice and a stool, more and more are opting for some creature comforts to keep them comfy until the fish start biting. Ice fishing is usually a winter activity, where recreational and professional fishermen drill holes in the ice of a lake to fish. It is a lot of fun if done with the right equipment, knowledge of safety rules, and fishing etiquette. Once you have a tent or ice fishing shelter in place, the next item you’ll need is a heater to keep the inside warm and comfortable. This will make the tent or shanty habitable during frigid temperatures. A good heater is great both for keeping you and your friends warm and also can be used to cook your food. While each individual should get an ice fishing heater based on their needs and likes, the following factors should be considered when making the selection. You may need to consider the option of a radiant or convective heater, based on whether you plan to use it inside a tent or cabin, or outdoors. A convective heater will work inside a room, but not outside. While the heat output of a heater is measured in BTUs, that number doesn’t usually have an intuitive meaning for most. A square foot rating is a little more helpful, as you can tell that a heater rated for 120 square feet will be too much for a tent of 35 square feet. So just aim for a heater that meets your heating needs and don’t get something too big that will be too large and heavy to carry. Look for safety features like an oxygen depletion sensor, which will ensure that your fishing tent or shelter won’t get filled with toxic carbon monoxide. Similarly, having a tip over off-switch means your heater will automatically shut itself off when it falls over, preventing burns and minimizing fire risk. It is extremely important that your heater is rated for operating indoors, as it can emit poisonous gases like carbon monoxide. 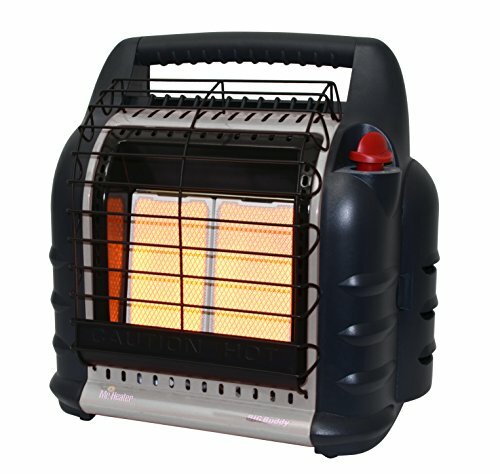 Any portable ice fishing heater you purchase should have an open-air source for fresh air to circulate into the shelter. 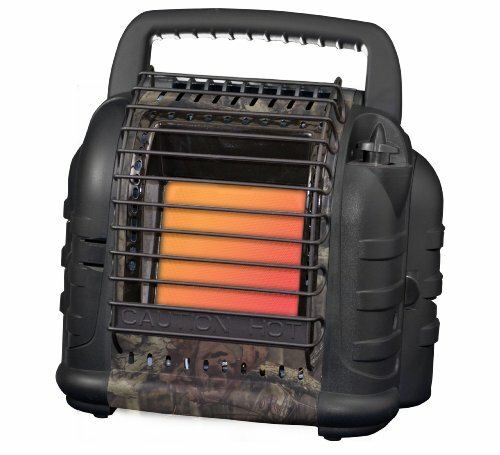 There are many heaters out there for camping and outdoor recreation. Let's take a look at some of the best ice fishing heaters that made our list! This model is a 4,000 and 9,000-BTU radiant heater for spaces up to 225 square feet. It is approved for both indoor and outdoor use. It is nearly 100 percent efficient in burning propane gas and comes with a fold-down handle, a swivel-out regulator for easy LP cylinder and hose installation, and two heat settings of 4,000 or 9,000 BTU per hour. The four position control has a Piezo igniter built-in, and on/off and low/high heat settings. For safety, there is a high-heat wire guard, a low-oxygen safety shut-off (ODS), and tip-over safety shut-off. The porcelain-coated, durable heat surface pushes radiant heat over a wide area and features a ceramic burner tile with shock absorbing insulation for durability and ease of replacement. Ideal for small and medium-sized spaces, such as ice fishing shanties and tents, this little heater is both dependable and functional. It will keep you warm on the coldest of days while using gas frugally. The included safety features make your ice fishing trip safe and comfortable. This heater has one heat setting of 3,800 BTU/hr and can be used to heat up to 95 sq. ft., while providing continuous heat for up to 5-1/2 hours at a 45-degree heating angle. It comes with a shutoff in case of accidental tip over and a low-oxygen shut-off pilot system for indoor safety, allowing you to control the comfort level. The handle folds down to reduce storage space. The heater also features a control with four position options and a built-in Piezo igniter with on/off and high/low heat settings which let you customize the heating level. It includes a wire guard that withstands high-temperatures and a swivel regulator to ensure simple installation of the LP cylinder and hose. The porcelain-coated heating surface is large and durable and heats a wide area with radiant heat with a ceramic burner tile that features shock absorbing insulation to ensure durability and ease of replacement. Ideal for small spaces like an ice fishing shanty of 95 square feet, this little heater will be great for keeping you warm on your next fishing expedition. It comes with plenty of safety features and is convenient to light with its built-in Piezo switch. 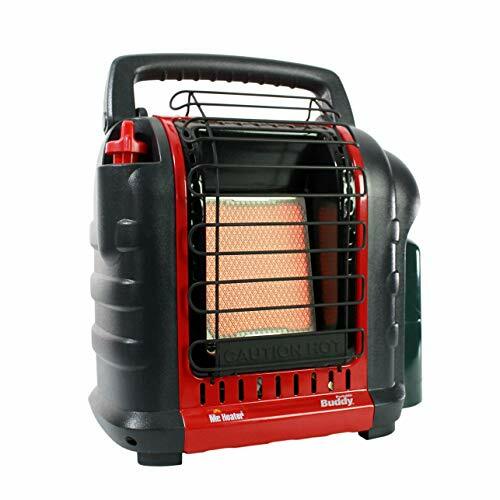 This propane heater is for outdoor usage, so it is ideal for people who need radiant heat while ice fishing. 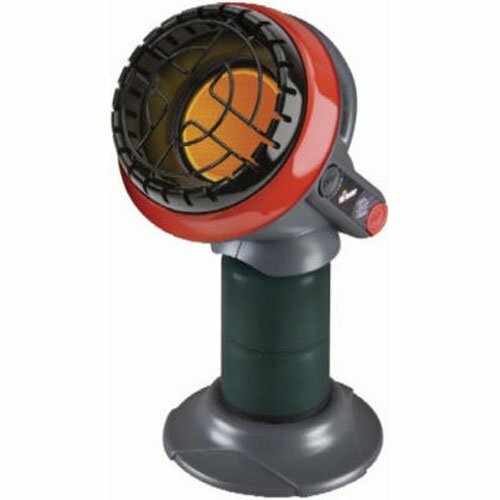 The Texsport Propane Heater uses 16.4 oz. or 14.1 oz. disposable propane fuel cylinders and adjusts up to 2,890 BTU's. It is easy to use and transport, and has safety features like a large paddle-shaped foot base to keep the unit stable, an automatic fuel shut-off valve if the flame goes out, and a safety grid on top of the aluminum reflector. It runs for approximately 4-6 hours per one lb. fuel cylinder. It has a durable stainless steel burner and comes in a stainless steel finish. This little heater will be great for keeping you warm on your next fishing expedition. It comes with plenty of safety features and is convenient to light with its built-in Piezo switch and is made specifically for use outdoors. This 4,000-18,000 BTU LP heater uses two 1 lb. cylinders and is ideal for heating cabins or enclosed spaces up to 300 sq. ft. This unit blends convection and radiant heat styles using an integrated fan to increase the unit’s heating capacity. The two swivel regulators allow you to use either disposable cylinders or a remote gas supply like a 20 lb cylinder with the additional purchase of a single hose and filter. The built-in Piezo sparking mechanism will turn on the heater and the Oxygen Depletion Sensor (ODS) and accidental tip-over safety shut-off keep you safe. The low, medium, and high heat level control knob keeps temperatures steady. The fan runs off 4 D-size batteries or an AC adapter. Effective for Spaces up to 300 sq. ft. This heater comes with plenty of safety features and is convenient to light with its built-in Piezo switch, and as expected from Mr. Heater, the durability and value for money is unmatched. 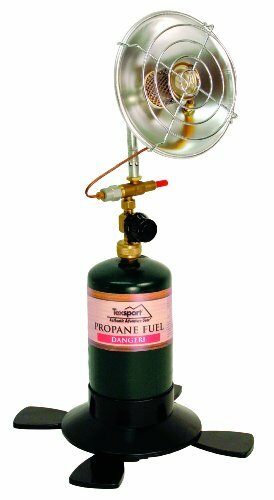 This patented radiant 6,000-12,000 BTU liquid propane heater runs off a single 1 lb. cylinder and is great for enclosed spaces like ice fishing shanties up to 300 sq. ft.
Use the swivel regulator for either disposable cylinders or a remote gas supply like a large gas tank with an additional purchase of a single hose and filter. Simply push the button and rotate the knob to light the unit, and a built-in silent electric ignition lights the gas. You will be sure to enjoy many years of safe, comfortable heat indoors with the included accidental tip-over safety shut off feature and the Oxygen Depletion Sensor (ODS). Like any other heater from Mr. Heater, this model is robust, efficient, and highly functional. The safety features will help you stay safe while enjoying the comfort of a warm hut. In order to heat up your ice fishing shanty or camper, keep your propane gas tank outside, and run a hose in from it to connect it to the heater. Make sure that there are no leaks, as it could create a dangerous fire hazard. Next, light up the heater and adjust the setting to the right heating output for the size of your tent or shanty. Now you’re all set to keep comfortably warm. Fit the protective grill in the slots on top of the heater (such as a Mr. Buddy heater). In some cases, the heater has a built-in cooking grill already. Place the food that you want to cook on top of the grill, (e.g. sausages, burgers, kettle of water). Wait until the food is ready, and then carefully remove the food and enjoy! In order to operate your heater safely both indoors and outdoors, always follow the manufacturer’s guidelines. Never use a heater indoors if it is not rated for indoor use. If your heater’s oxygen depletion sensor detects low oxygen levels, it will automatically shut itself off. Try to keep the heating element well protected from impact, and try not to let it touch the floor or come into contact with people. Ideally, it will have a good metal cage to keep it well away from contact. The best heater for an ice fishing shelter should ideally turn itself off when not on an even surface since a lot of these tents are made of heat sensitive synthetic material. To help you figure out what size the ice heater should be, first measure the space in your shelter. Most heaters will include the amount of space they are designed for in the product description. When in doubt, get the more powerful heater, so long as it still easily fits in the shelter. In order to help you calculate the BTUs you require from your heater, use this handy formula. Cubic feet (volume of your shanty) x Temperature Increase in Fahrenheit times 133; where the last value is always a constant. If you’re using Celsius, then replace .133 with .2394. So, cubic feet x1.33 will give you the number of BTUs you need. Or cubic feet x .2394 for Celsius. Now that you know what to look for in an ice fishing heater, you should have no trouble selecting the right heater for your needs. Keep in mind the safety features, the heating requirement for your ice fishing shanty, and whether you need to use the heater as a grill.